Our April, 2016 newsletter will be available online at Dr. Krohse's Blog. If needed, please use the links in the footer to opt out or change your account. Last day to call in for our March Madness Promo! Additionally Dr. David Krohse will personally donate $20 to the United Way, the organization supported by Iowa State coach Steve Prohm, for each new patient who comes in using this March Madness promo! 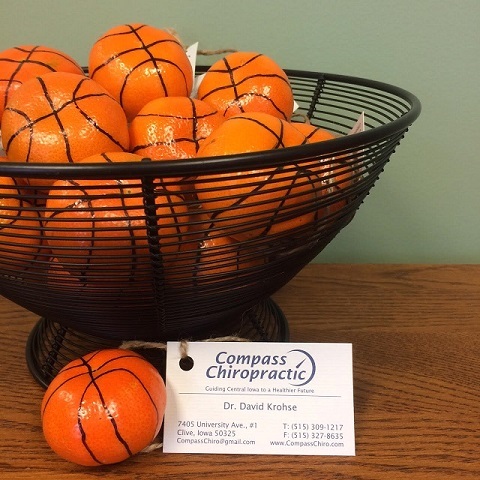 Share this email or one of our "cutie" basketballs with a friend or family member who is being driven mad by neck pain, back pain, headaches, or sports injuries! Tuesday, April 26 at 5:30 PM - Free! "Essential for new runners and those who are sick of being among the 65-80 percent of runners who get injured in a given year!" At 5:30 pm on Tuesday, April 26 Compass Chiropractic will host a Pain-Free & Efficient Running Workshop. We'll start by shooting some video of your current running form for comparison later. Then the concepts and techniques of low impact running styles will be introduced. A workshop will follow where participants will practice simple drills to integrate these concepts into their running. The session will end with video and slow motion review of participants running form pre and post concepts and drills. Participants should arrive in clothes and shoes suitable to run in. Please RSVP to 515-309-1217 or compasschiro@gmail.com. Check out the testimonials from past participants below! Just wanted to drop you a line thanking you so much for last night's workshop. I incorporated the simple techniques into my run tonight and I ran faster than I ever have, had more energy at the end - never ended up feeling winded or tired and actually felt like I could have gone another couple of miles - and my knees didn't hurt and aren't hurting now at all! Thank you so much. I'm thrilled and looking forward to my long run this Saturday to see what a difference it makes there. Dr. Krohse was referred to me by a colleague and quickly became a trusted care provider for both chiropractic adjustments as well as ART treatments. As an amateur athlete/triathlete, I was battling issues with neck pain/headaches and knee pain. Adjustments as well as ART helped get me into a maintenance mode with my overall wellness, but I continued to have some nagging issues with my right knee. We were able to schedule time to go through the techniques and philosophy of Pain-Free Running. At first I was in denial about my heel striking but after reviewing the video and discussing some of the drills, it was obvious I had room for improvement. Initially the changes felt awkward after decades of my old running style and my running times per mile were definitely slower and not impressive. What I did note fairly quickly was the reduction of pain in my knee which has since gone away. It's been over two years since I've changed my technique and I have been able to cut close to a minute per mile off my average pace in Half Ironman races (sub-7:45's now) as well as feel my running is more effortless. It's spring and I like to take my activities outside. Sometimes I want to travel light and don't want to carry a small purse or backpack, and depending on what I'm wearing, pockets aren’t always an option. 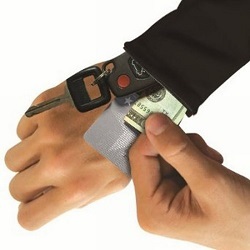 Wrist wallets are a handy solution to the "I need my stuff, but don't know where to put it" dilemma. Small wrist pouches come in handy in lots of different situations. For me -- they are most helpful when I'm out for a long walk and don't want to be bogged down with a bag or purse -- but do want to take along my cell phone, ID and little money in case I need to make an "emergency" ice cream or yogurt stop! They are also perfect for keys, lip balm or small tubes of sunscreen. I have found them at Scheel's and Kohl's and a variety of other sporting goods and department stores. April showers bring May flowers... and if you have kids those rain showers bring on lots of cooped up energy needing to be burnt off! Sky Zone Indoor Trampoline Park is great outlet to jump off some energy on those rainy days when outside play is not an option. Sky Zone is a great place for kids of all ages. They offer open jump, a SkySlam court, Ultimate Dodgeball, Kids Court, and a Foam Zone! SkyMania - Friday Nights 8 PM - 10 PM: Includes 90 Minutes of jump time, two slices of pizza and a drink (soda or bottled water), $18 for ages 10 to 15. 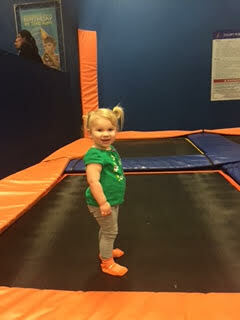 Toddler Time - Wednesday & Thursday 11 AM- 12 PM $8.00 Per Child and Parent or Guardian jumps for free. Ages 5 and under only. My friend and I took our two toddlers and an 11 year old and everyone had a blast. Toddlers have a special area just for them when jumping outside of the allotted Toddler Time so they can stay safe away from the "big kids". The two little ones jumped for 30 minutes and the 11 year old jumped for 60 minutes. They were all ready for a snack and a nap afterwards! So put down the video game controllers, turn off Netflix and head over to Sky Zone in Grimes for a fun, fit way to spend the next rainy day. A couple of years ago, my boyfriend and I sought out something unique for the Halloween season. We heard about a cabaret involving scenes from Bram Stoker’s “Dracula” and decided to give it a shot. That chilly eve arrived and, dressed as Poe-esque ravens, we stepped into a gorgeous mansion in Sherman Hills where were warmly welcomed as if a private dinner party were taking place. There was an intimacy to the performance I have not encountered at a show before; the actors, in their striking, period-specific costumes, wove in and around the audience and adjoining rooms- just inches from our faces at times. Skilled and mesmerizing, they prompted gasps and laughs. The grand, historically-preserved rooms of the mansion became filled with clever acting, music, gaiety, and, of course for that night, Medieval mystery. Iowa Shakespeare Experience (ISE), a local non-profit troupe, fed us all a thrilling night of fright! ISE might be best known for their spring and summer Shakespeare shows in the Metro area; did you know that many of them are free?! Utilizing antique and downtown outdoor environments, ISE’s actors animate and amuse through adaptations of one of the most eminent playwrights of all time, and, more importantly, actually do the British bard justice! Even those who have not been fans of Shakespeare fall in love with the ISE shows. In an audience testimonial, one person mentions how she had to drag her husband to a production, but, by the end of it, the husband was excited to return to another ISE Shakespeare event! The dramatizations are also a fantastic time for all ages. If Gothic and Elizabethean styles aren’t your craze, ISE also performs a dazzling version of Dickens’ “A Christmas Carol” during the winter holidays, and it all transpires throughout assorted rooms of historic Terrace Hill’s stunning mansion. ISE’s use of ambiance is another element of their expertise; they understand what a vivid difference it makes to a theatrical experience! Many of ISE’s stagings sell out, and sometimes pre-registration is required. ISE is certainly one of Des Moines’ treasures! A commonly repeated myth states that humans use only 10 percent of our brainpower. While Scientific American tells me this percentage majorly underestimates human brain use, I'd wager that most smartphone owners use less than 10 percent of the function of the electronic brain they keep in their hand or pocket. I know this rings true for me. However, I have found a couple priceless ways to utilize more of my smartphone's powerful brain. 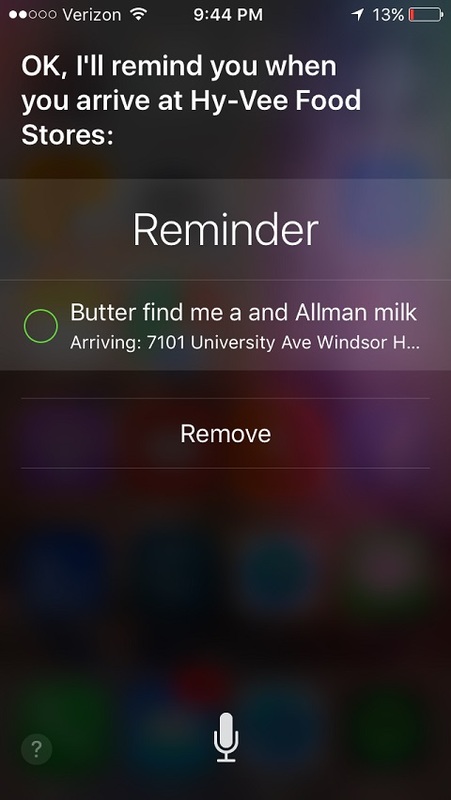 The most valuable smartphone trick I've learned has been location-based reminders. While sitting at home, I might put the last two AAA batteries in the house into the TV remote control. 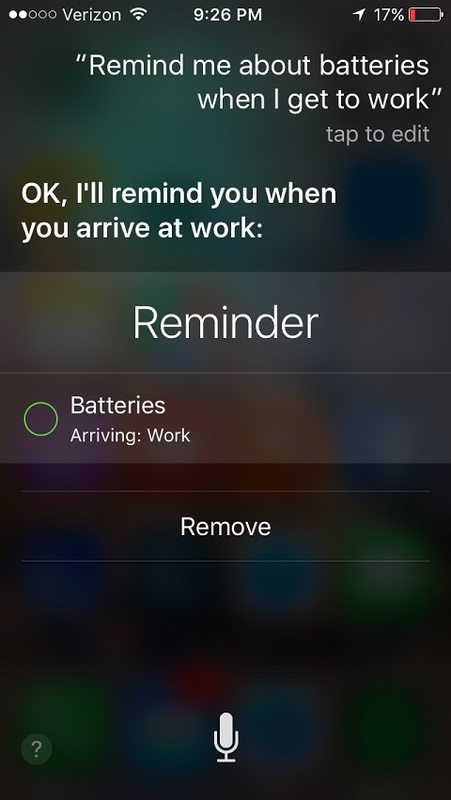 Realizing that I have a bulk pack from Costco at my office, I simply hold down the button on my iPhone for a second and tell Siri "Remind me about batteries when I get to work." The first time I did this Siri told me to add my work address to my personal contact info in the address book. Now when I pull into my office parking lot a reminder pops up and I can go in and put some batteries in my bag to take home instantly. It's amazing!! !